Having trouble sleeping with all the family surnames buzzing in the head? 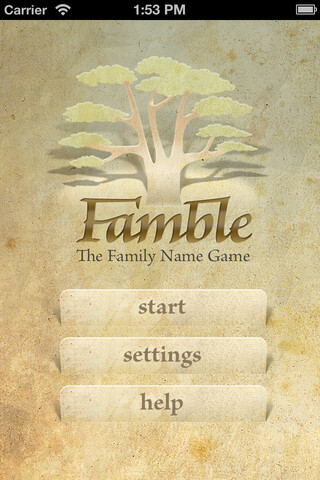 The answer is FAMBLE – play around with even more familiar surnames on your iPhone and iPad and iPod! A fun game for the addicted genealogists - to increase their level of addiction even more. 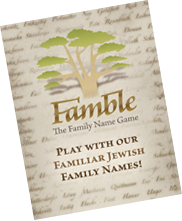 Fun + ancestry + names + learning = FAMBLE - the familiar game with a family name twist. FAMBLE is the classical word search type game, but the words you have to look for are Jewish surnames. There are some 3,000 (Hungarian) Jewish surnames hidden in the matrixes, waiting for you to discover them. 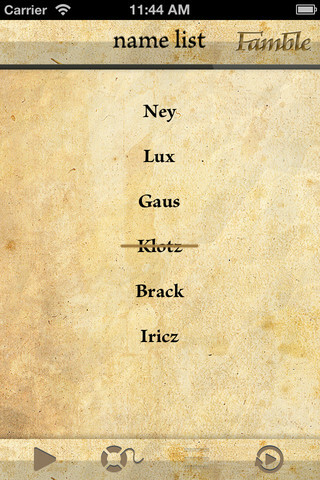 Schwarz and Weiss and Pollack and Klein and Kohn and Gross and Lowy – they are all there, of course. But you can also look for Diamanstein and Josefsberger and Vogelhut and Gläubiger and Hechtmann and Hochteil and Gajduschek – and a thousand more less well known Jewish names. No better way to teach the children about our ancestral Jewish surnames – than FAMBLE. You can also add your own family names and off you go hunting for your very own ancestors! 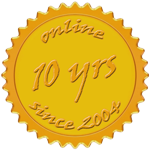 Share your experience on Facebook / Hungarian Jewish Roots! If you feel like sharing ideas with not only us but also with others doing family research about Hungarian Jews, please put your thoughts and ideas into our guest book below. Please note that this site is supervised and the general netiquette and forum rules shall be applied to all messages.